It’s not very often that we see old meeting older to create something new. Today was one of those days when Jean Van Roy of Cantillon let the world know about a unique batch of Lambic he is fermenting. In the official message below he tells us why it’s unique and how the idea came about, but basically they have put traditional Lambic into ancient style vessels (circa 4800BC) called AMPHORAS. 12 of them to be exact. 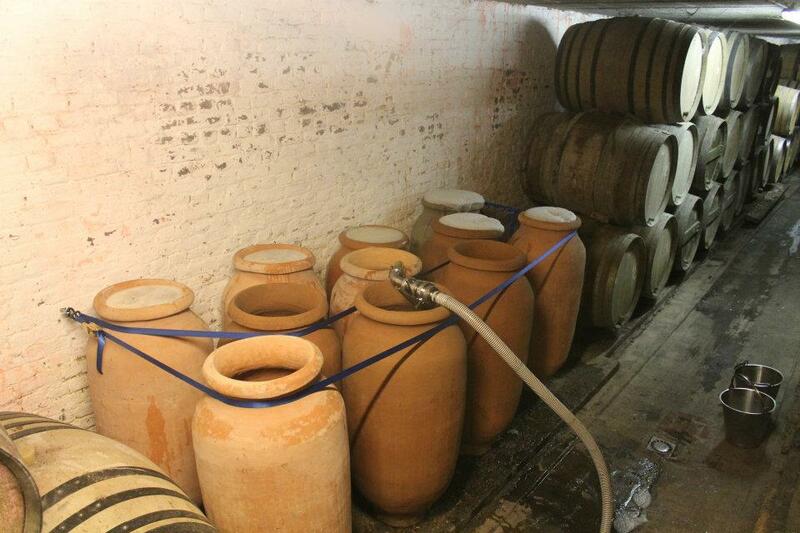 These vessels are used by some winemakers who prefer a more natural fermentation very similar to how Lambic is fermented. Even though the wort has just hit the Amphoras, Jean did have a few minutes to answer questions for me. You can read my brief interview after his official message. 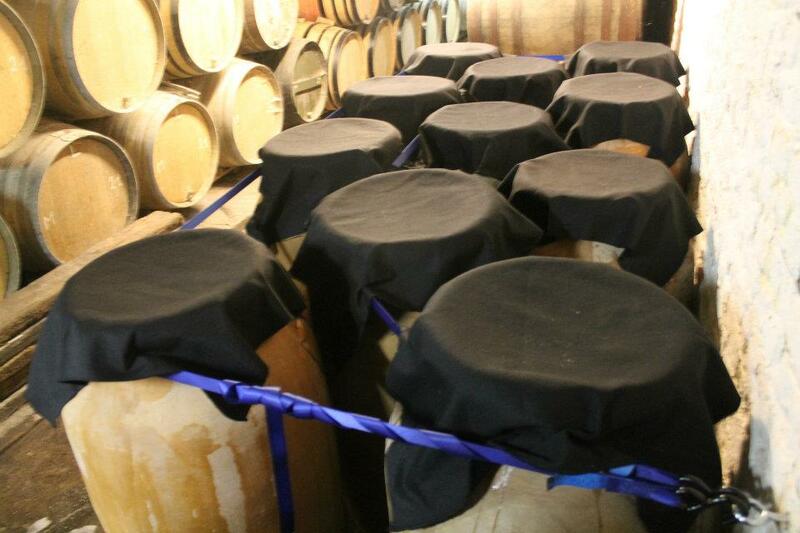 As you may know, Lambic and wooden barrels have been inseparable partners for centuries. Until recently I would have never even imagined myself putting my beer into anything besides a barrel, and yet…And yet, a blind wine tasting session completely changed my vision of things.On that occasion I tasted something which truly caused me to lose my composure.Its exceptional fragrance and finish, unbelievable complexity bringing together fruitiness, freshness and minerality made it incomparable with a “traditional” wine. There was clearly something different at work here, but what? Thankfully, Gabrio Bini, an Italian winemaker, was present at the restaurant organising the event and I soon understood that he would be able to answer my numerous questions.Gabrio’s wines are produced in Sicily and matured in, wait for it, amphoras! He spoke to me about his amphoras with such passion and enthusiasm that I very quickly started imagining putting my Lambic into this type of container.After all, what could make better sense than putting a centuries-old beer like Lambic in a container which has been around since antiquity! 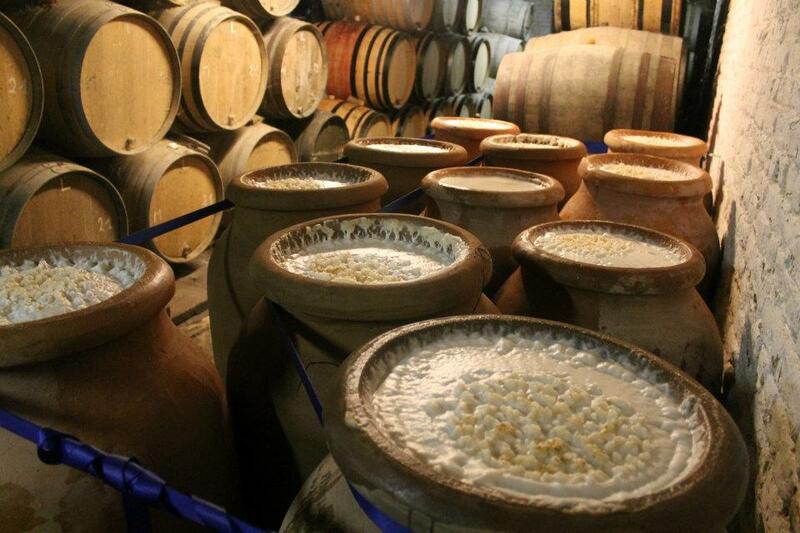 The winemakers currently experimenting with amphoras are all producers of natural wines (organic or biodynamic techniques) fermented without the use of additional yeast. By the way, this is another element such wines have in common with traditional Lambic.In any case, the approach here involves optimally oxygenating the liquid and subjecting it to lower temperatures to favour slower fermentation. 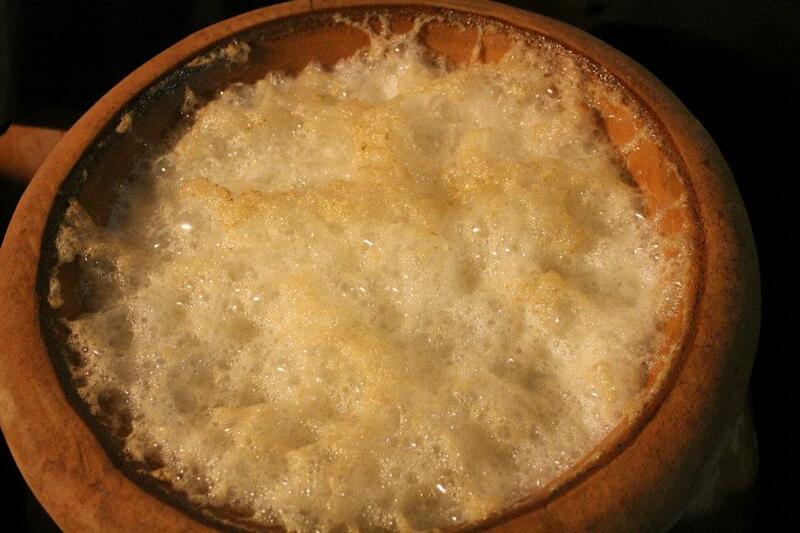 I’m happy to say that the entire team at Cantillon is very impatient about getting started with this new project.In fact, besides just being curious about the results we’ll obtain with this kind of maturing approach, letting Lambic age in amphoras makes us feel a bit as if we were travelling far back in time. 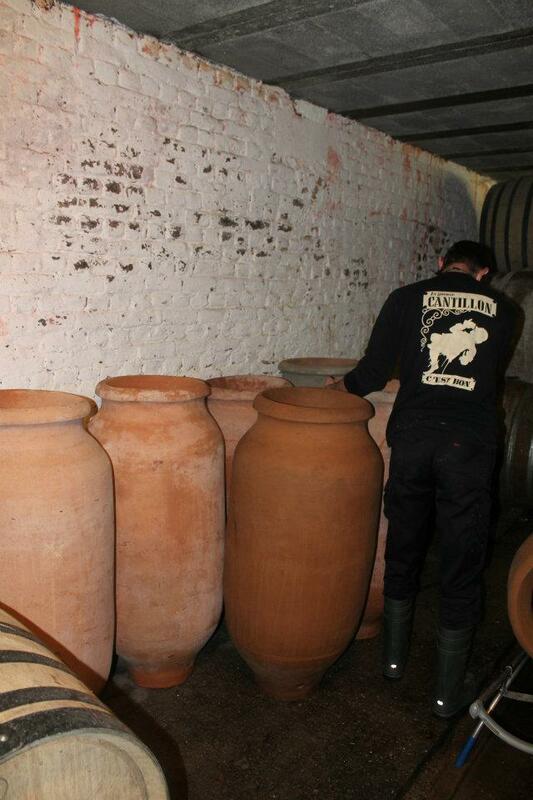 Some time ago, 12 amphoras of 200 litres each arrived at the brewery.After soaking them in water to make them less porous, they were filled with the Lambic produced during the 19th brewing session of season O (which took place on 26 January 2012). Rest assured that we’ll keep you updated on how the fermentation process develops and, assuming things go well, start making plans for a tasting session this fall. ETF- This project is barely underway, but any idea if this will be bottled or draught? 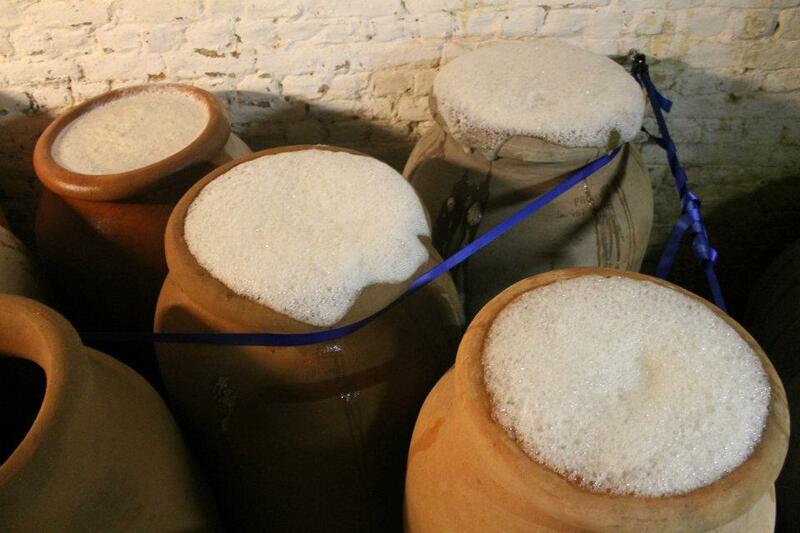 ETF- Do the Amphoras have lids or will they remain uncovered during active fermentation? Jean Van Roy- They will have a thick cloth covering actually. Then later corked after the first fermentation. 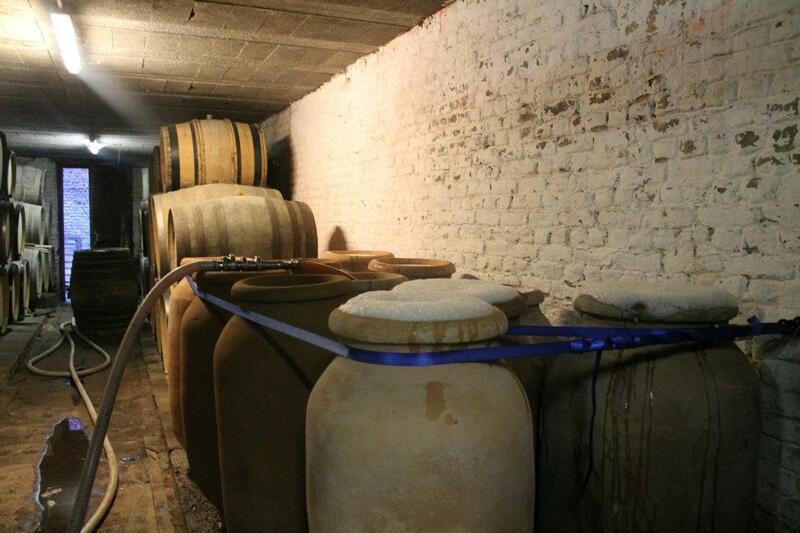 ETF- Are these Amphoras new or previously winery used? Jean Van Roy- They were purchased new. Coming from South of Spain. If the idea of moving Lambic forward by going back wasn’t cool enough already, remember Jean wants everyone to follow this experiment with him via their Facebook page. I’m really looking forward to seeing more pictures and learning along side one of the greats how this Lambic fermentation might differ. When great artists such as Jean share information as he is planning to do, then we all win. Now I’m off to the garden shop to buy a big pot to do my own experiment! Castle Hill Cider uses a similar technique to produce its Levity. The vessels (called kvevri) are buried underground as in the Georgian winemaking tradition; Gabrio Bini also appears to be burying his amphorae judging by the pictures. Cantillon is a must-visit for all wild beer enthusiasts. I’ve visited twice (2000 and 2006) and am due for another visit! Wow, awesome to hear Cantillion is trying this. I agree, must visit, it was amazing how simple the place is. I met a girl once from Belgium who had a ceramic brewing pot family heirloom, so it’s likely not without precedent. Any thoughts on what to use for a homebrew amphora? I’ve always wanted to make a Yorkshire square.